The presses and machinery in the Printing Works illustrate the equipment to be found in a typical job-printing shop in the early 1900's. Our presses, originally from England and the United States had their early lives with printing companies in Hawkes Bay. Our large presses -the Challenge Gordon platen Press was built in Chicago in 1907, and the Thompson Gem No.2 platen was built in Manchester, England in 1926. Originally treadle powered, they were eventually converted to being motor driven so minimising the fatigue of the press operator. Today we have reverted to treadle power ! The 1920's and 30's were the era of the small table top press targeted at boys as hobby printers, and to small business owners as a press for circulars and advertising - printing on small hand presses with type and the same techniques as the professional printer. Our Works includes two from the English firm of Adana which are capable of more than 400 impressions an hour hand-fed, and are ideal for cards, invitations, letterheads and labels. Proofing Presses play an important role in all print shops. Newly set type is 'proofed' for errors in setting, spelling and alignment before it is 'locked up' for printing. Being a flatbed press they are also popular for printing posters. 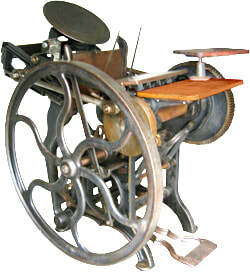 A Challenge proofing press (USA) from 1899 and a Farley Press (UK) from 1935 are operated in our Works.